As the season’s first snow fell on New Haven, a crowd filed into a Yale School of Management classroom, shedding coats and hats as they settled in for CITY’s fall Accelerator Pitch-Off, a chance to hear 14 Yale student teams pitch the big ideas they’d developed over the semester. The Accelerator program, which takes place each fall and spring semester, guides teams through the process of turning their innovative ideas into effective organizations, projects, and ventures. Unlike many Accelerators, CITY’s Accelerator is open both to for-profit ventures and to a broader array of ideas, from nonprofits to arts projects and social movements, and the teams accepted to this fall’s cohort reflected this big-tent approach: projects included physical products, digital platforms, social impact initiatives, and more. “Teams enter the Accelerator at a range of stages: some with well thought-out plans for their ideas, others with prototypes of their offerings, and others who have launched to their audience,” says Emma Funk, Social Innovation Fellow at CITY and the co-lead of this fall’s Accelerator. Regardless of where they are in their process, all teams enter the program seeking a boost. “Typically teams have already made use of other resources on campus and beyond Yale,” explains Nya Holder, CITY Innovation Fellow and Accelerator co-lead, “and now they’re ready to take their work to the next level.” To help them do this, the Accelerator provides support in three key areas: $1000 in non-dilutive seed funding, mentorship from experts in CITY’s network, and a series of workshops on core skills like user discovery and developing business models. The LitKit team at the Pitch-Off. For some teams, the Accelerator prompted them to pivot in unexpected directions. “We spent the first six weeks of the Accelerator developing our original product concept — internship placement in public service organizations supplemented by training, mentorship, peer networking, and funding support,” says the Representation 2.0 team, which is building an incubator to encourage college students from diverse backgrounds to run for office. “Our development plan included informal focus groups….we learned that there were a few issues with the original concept that led us to reevaluate the product design. We recently pivoted to focus, at least in phase one of the project, on the ‘training’ element of the original idea.” Guided by these insights, the team is now preparing to launch a pilot training in the spring. Beyond these tangible project milestones, the Accelerator also encouraged students to invest in cultivating relationships and team dynamics. “I loved the moments when teams took time to work on the parts of their venture that weren’t their external offering, but on the team that makes their work possible,” says Holder. Throughout the program, students explored concepts like communication styles and organizational culture, and the Accelerator’s final session concluded with a discussion of emotional intelligence for founders; team members even got a chance to write letters of gratitude to each other as part of this. To Holder and Funk, it was particularly gratifying to see how these lessons helped facilitate a supportive culture across the cohort as a whole. “It was awesome to watch teams thoughtfully engage with each other and build on each other’s ideas,” notes Funk. Soil Samplers, with their prototype in hand, shared how they’ve built portable, affordable soil sample extraction and drying devices. They hope to manufacture the devices as a field-ready kit for soil carbon content analysis. Briomics introduced what they call “the 23andMe for gardeners and farmers,” a simple DNA sequencing kit. Using resources at Yale’s CEID, they’ve worked on a sequencing protocol, and now plan to use space at Yale’s West Campus to conduct a trial. From here, several teams building service platforms shared their work. ReRent is an Airbnb management service that enables students to monetize their apartments while they’re away on school breaks. Founder Alikiah Barclay shared ReRent’s successes in New Haven to date and how the venture plans to scale up. Y-Circular kicked off their pitch by holding up examples of things they had bought but rarely used, from a vacuum robot to a tennis racquet. They then introduced their platform for people to rent their own little-used objects, which is now live on social media. SciTeens opened by emphasizing the scientific ingenuity needed to tackle the challenges currently facing the planet, before sharing the collaborative platform they’ve created for the next generation of scientists — teens — to connect with peers, mentors, and funding. Next, the audience heard from teams whose projects were aimed at high school and college students. 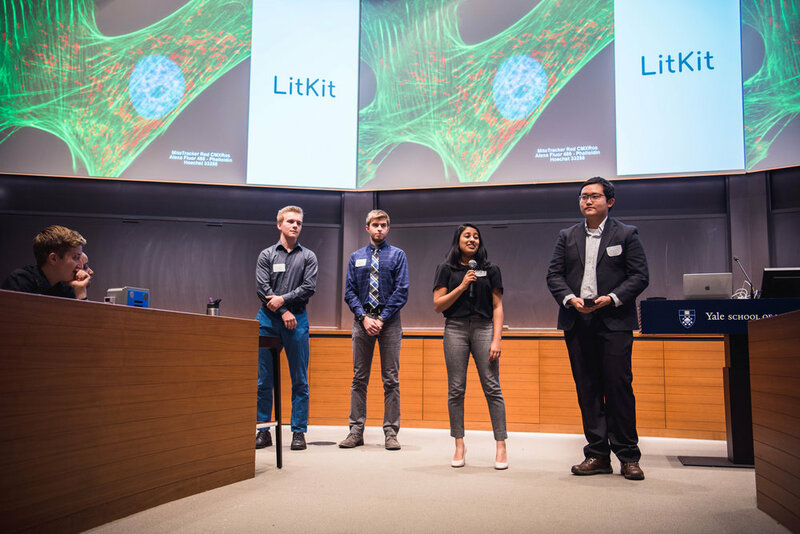 LitKit aims to transform high-school biology classes, broadening access to low-cost fluorescence microscope technology. Handing their microscope attachment prototype to the judges, they shared how they’ve been conducting user research and working on pathways to bring the device to classrooms. Representation 2.0 shared their vision and progress toward building a leadership incubator to encourage college students from diverse backgrounds to run for office, outlining the planned content of their training and the partnerships they’re building to get it off the ground. After Hawkings led with a trivia question on the growth of the impact investment sector, three teams introduced diverse approaches to investing in social impact. Greater Good Solar, a team composed of two siblings, outlined their model for financing solar installations in low-income communities and using a portion of the profits to fund education and green jobs training in these communities. The Brio Fund’s husband-and-wife team opened their pitch by sharing how they had partnered with a changemaker in Ecuador to build mental health resources in his community. From there, they discussed how they’re building a nonprofit that funds and consults with mental health entrepreneurs like this to help them respond to local mental health needs. We Develop is a platform on which people can invest in real estate development projects in medium-sized Mexican cities. Founder Ana Diaz Benitez shared her approach for delivering high returns to investors while spurring wealth generation in communities in Mexico. Finally, the final group of teams presented products that use new technologies to solve problems. DropLet is a water attachment that calculates how much water a user consumes and wastes, using the data to promote behavior change. The team shared their work to date and their current focuses on user research and building an app. Istya Biotech educated the audience on medical stents’ failure rates before pitching their innovation: CRISPR coating stents aimed at reducing these failure rates, which they’re currently prototyping. The Orb closed out the Pitch-Off with a look at their modular smart device, which enhances visits to spaces like museums without the need for a smartphone app. Pointing out issues with current tools like apps and audio tour headsets, they highlighted how their product could transform the museum experience for diverse audiences. SciTeens won the audience choice vote. Want to learn more about these teams and their innovations? View the full Pitch-Off here. You can also meet the teams in this article and in story highlights on CITY’s Instagram. Interested in applying for the spring 2019 Accelerator? Join us for an info session on 11/29!